Starform Glitter Stickers silver: 1004, gold: 9302, 9305, violet: 9302, 9305, orange: 9302, 9305. Card: soft yellow (12,5x12,5 cm). Stick the border stickers and small Easter eggs onto the card as shown. Stick Easter eggs of different sizes and colours in a circle (Ø7,5 cm) onto lilac paper. Cut this out and stick it onto the card. Stick a gold basket in the middle. 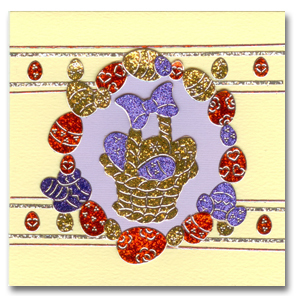 Cut 2 Easter eggs and the bow out of the violet basket and stick these parts directly onto the gold basket.